I’ve transported all posts & comments on this blog to a new home on my own domain. 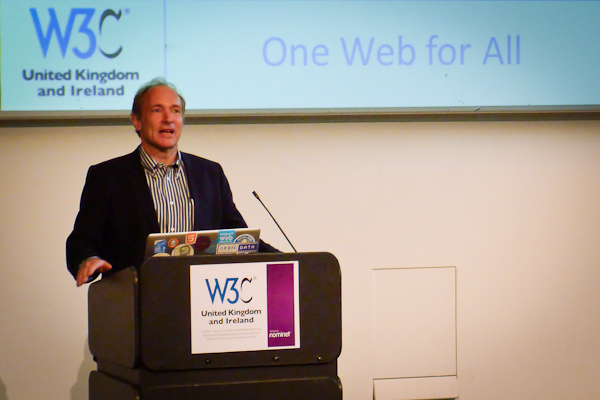 This is a nice follow-on to my previous post regarding the web and the work of the W3C. As we’ve seen, the web and its technologies have been evolving and getting more powerful and while some will still eschew the growing relevance of the web (and its friendly neighbourhood viewing window, the browser) in a world of apps apps apps, the W3C continues to push forward its capabilities. So step forward the newly formed Web Real-Time Communications Working Group. The mission of the group is to define a set of client-side APIs to enable real-time communications through the browser…video, audio, no plug-ins or downloads. The Charter page also states “supplementary real-time communication” so we’re also looking at screen sharing – or at least ‘browser window sharing’ – I think I’d be safe in saying. One of the great things about this – imho – is that the working group will be looking closely at device APIs and pushing work on those forward, which, along with the DAP (Device APIs & Policy WG) should hopefully propel the development of APIs for device capabilities such as use of camera, microphone and the whole area of media capture and streaming. I then automatically think of the mobile space…mobile web apps for video chat anyone? The working group has a timescale that looks at getting their first recommendations out toward the end of next year. 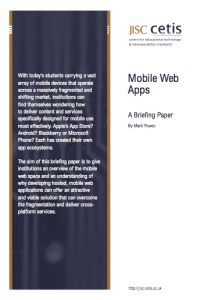 I’ve recently written a JISC CETIS briefing paper on the topic of Mobile Web Apps. With the growth and constant shift in the mobile space institutions could be forgiven for feeling a little lost as to how to best tackle the issue of delivering content and/or services that are optimised for mobile devices. Apple, Android, Blackberry, Windows Phone…app ecosystems seemingly everywhere you turn and each requiring different development approaches; SDKs, programming languages, approval processes and terms & conditions. I think it’s fair to say that for institutions, looking to deliver to mobile devices while being as inclusive as possible, this area is something of a minefield. A viable, alternative approach is developing Mobile Apps using open web technologies and standards; technologies that continue to improve performance and offer more powerful functionality – as is now being talked about quite a bit on the topic of HTML5. It’s in PDF format but I’ll also be looking to get it in web form on the CETIS website over the next few days and, of course, I’d welcome any feedback and questions on it here. Multiple simultaneous channels, analogous to browser tab on the desktop, let authors create dynamic and interactive AR content using existing web development toolsets. The browser is stated as being the reference implementation of Georgia Tech’s work on the KHARMA Mobile AR Architecture, which combines HTML for content with KML for defining geographical co-ordinates (as used by Google Maps, Google Earth & Yahoo Maps). 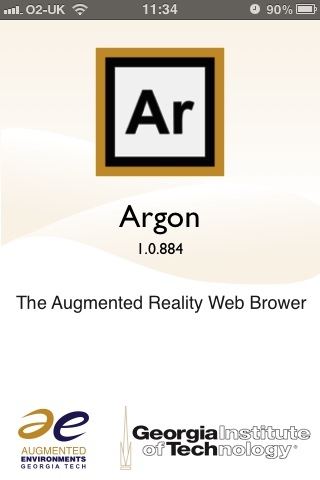 One thing that seems to counter-balance this standards flag bearing though (for me, at least) is the fact that Argon is only available on iPhone – in fact, the developers go so far as to specify that it is best run on the latest version, iPhone 4. Hopefully that will change over time and we’ll see versions for the other popular mobile platforms too: the ever growing Android and the recently adrenaline-injected Windows Phone 7. After all, it would seem a little odd lauding the open standards route while then being restricted to a single delivery platform. 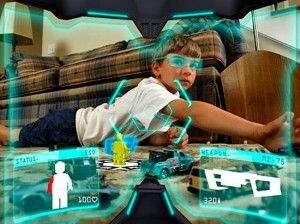 But there’s plenty of growing room in the still young AR space. With the technology making a significant appearance in this year’s Horizon Report – given a ‘Time-to-adoption’ period of 2-3 years, and us already seeing mobile augmented reality being implemented at Exeter Uni on their JISC LTIG Project: Unlocking the Hidden Curriculum, it’s good to see a new offering in this area to possibly compete with the current big players: Layar, Wikitude & Junaio. My wish? 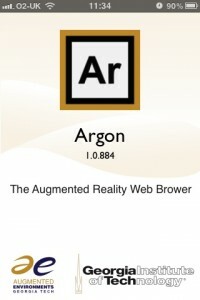 My wish is that we could see something like Argon develop into a platform for AR developers, built on open standards, that would be supported by those players and open up the AR space to easily create interactive and immersive mobile AR experiences & content that you could then deploy cross-browser. Like I say though…early days yet. Hopefully we’ll see it happen. Well…I’ve been travelling around the interweb, reading – or simply adding to Instapaper for later and trying to get round to reading – lots of lovely articles, blog posts and suchlike on the current happenings around the Mobile Web. As you’ll well know (seeing as you’re reading this) the Mobile Web is a hot topic at the moment, so I thought I’d highlight some of the things I’m reading up on right now. The guys at Opera are superb when it comes to talking and teaching about web development techniques and the current state of the web. I’ve enjoyed listening and talking to both Patrick Lauke and Bruce Lawson in the last few months and Bruce has taken his talk around this and built it into a handy guide, available on the Opera Developers website. Bruce talks about the options available when looking to deliver your content to mobile devices and gives loads of really useful advice and tips on stuff to do, stuff to avoid and delivers a really nice outline on why CSS Media Queries are so powerful and can help you build mobile-aware, adaptive websites that don’t have to check which browser the content is being delivered to but checks the device settings themselves (think “display resolution”). I strongly encourage you to check this guide out if you haven’t before. Following on with the CSS Media Queries angle, this article on quirksmode gives you a full walkthrough of how to combine <meta name=”viewport” content=”width=device-width”> with media queries to enable your website to resize to fit any display. It tells you what these do, why you should use them and gives the whole technique, with helpful screenshots. Excellent. This is a truly great set of slides that Bryan Rieger of Yiibu recently delivered at the Over The Air event at Imperial College, London. Here Bryan gives us an outline of device usage, mobile browsers and – echoing Patrick’s & Bruce’s message – the options available to us when it comes to making mobile friendly websites (and apps – we can’t ignore those). Bryan puts a damn good point across that maybe we should design our sites for mobile devices FIRST, then add in the capability for the site to adapt for desktop. It’s a different way of approaching the whole creation and I’m really into that way of thinking. Haha…now to end with something more leftfield This article, written by web designer John O’Nolan takes a playful swipe at those people that trot out the whole “Next Big Thing” line. John gives us an entertaining look at the evolution of the web on mobile and does put a nice perspective on things. What’s even better is that some of the thoughtful comments round out the whole thing to make a nicely smart piece on viewing the state of the mobile web. March sees the end of the JISC funded XCRI Support Project as it signs off leaving the development of the XCRI (eXchanging Course Related Information) specification for sharing (and advertising) course information looking very healthy indeed. The support project picked up where the original XCRI Reference Model project left off. Having identified the marketing and syndication of course descriptions as a significant opportunity for innovation – due to the general practice in this area being one of huge efforts around re-typing of information to accommodate various different systems, sites and services…then to have that information maintained separately in various places – the XCRI Reference Model project mapped out the spaces of course management, curriculum development and course marketing and provided the community with a common standard for exchanging course related information. This would streamline approaches to the syndication of such information and give us the benefits of cost savings when it comes to collecting and managing the data and opens up the opportunities for a more sustainable approach to lifelong learning services that rely on course information from learning providers. 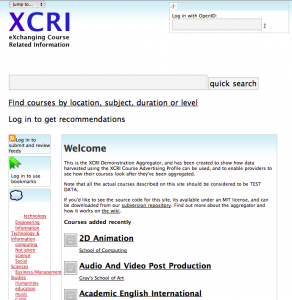 Over the course of the next three years the XCRI Support project developed the XCRI Course Advertising Profile (XCRI-CAP), an XML specification designed to enable course offerings to be shared by providers (rather like an RSS feed) and by other services such as lifelong learning sites, course search sites and other services that support learners in trying to find the right courses for them. Through the supervision and support of several institutional implementation projects the support project – a partnership between JISC CETIS at the University of Bolton (http://bit.ly/PZdKw), Mark Stubbs of Manchester Metropolitan University (http://bit.ly/PZdKw) and Alan Paull of APS Limited (http://bit.ly/cF6Fhd) – promoted the uptake and sustainability of XCRI through engagement with the European standards process and endorsement by the UK Information Standards Board. Through this work the value of XCRI-CAP was demonstrated so successfully as to ensure it was placed on the strategic agenda of national agencies. Hotcourses manages the National Learning Directory under contract from the Learning and Skills Council (LSC). With over 900,000 course records and 10,000 learning providers the NLD is possibly the largest source of information about learning opportunities in the UK, which learners and advisers can access through dozens of national, regional and local web portals. Working with a number of Further Education colleges Hotcourses is now developing and piloting ‘bulk upload’ facilities using XCRI to ease the burden on learning providers supplying and maintaining their information on the NLD. UCAS also continues to make progress towards XCRI adoption. Most recently, at the ISB Portfolio Learning Opportunities and Transcripts Special Interest Group on January 27, 2010, UCAS colleagues described a major data consolidation project that should pave the way for a data transfer initiative using XCRI, and cited growing demand from UK HEIs for data transfer rather than course-by-course data entry through UCAS web-link. The project is a two-phase one, with XCRI implementation in phase II, which is due to deliver sometime in 2011. Having ensured that the specification gained traction and uptake the project has worked extensively at developing the core information used by XCRI into a European Norm with harmonisation from other standards that addressed this space developed elsewhere across Europe. It is this process which has seen the evolution of XCRI from a standalone specification to a UK application profile of a recognised international standard. This could now be transitioned to an actual British Standard through BSI IST 43 (the committee of the British Standards Institution which looks at technical standards for learning education and training). At the same time adoption of the specifications were continued to be supported through engagement with policymakers and suppliers while the technical tools developed for adopters continued to be updated and maintained. Up to press there have been around 15-20 “mini-projects” which were funded to pilot implementation of XCRI within institutions. These looked at developing course databases using the specification, extending existing systems and methods to map to XCRI and the general implementation of generating the information and the exporting of this via web services. Not to say that this was the only project activity around XCRI. Various other Lifelong Learning projects have had an XCRI element to them along the way and all these have contributed to forming an active community around the development and promotion of the spec. 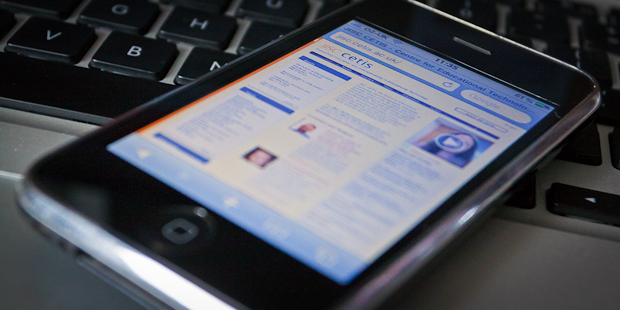 This community’s online activity is centred around a wiki and discussion forum on the XCRI Support Project website at http://xcri.org and while the support project is now officially at an end, the website will stay around as long as there is a community using it – currently its maintained by CETIS. Some XCRI.org content may move to JISC Advance as XCRI moves from innovation into mainstream adoption. However, as long as people are trying out new things with XCRI – whether thats vocabularies and extensions or new exchange protocols – then XCRI.org provides a place to talk about it, with the LLL & WFD project at Liverpool (CCLiP – http://www.liv.ac.uk/cll/cclip/) currently looking at how to improve the site and provide more information for non-technical audiences. Augmented Reality – A Game Changer in Mobile Learning? I think we’re getting to the point where, by now, many of you will have found it hard to avoid hearing about the latest technology buzz. No, not Cloud Computing. This technology is, shall we say, more ‘tangible’. It is – quite literally – technology that you can hold in your hand. Still. It’s an exciting technology and one that – like Cameron’s 3D in cinema – will be a game-changer (imo), not simply a fad, given the opportunities it will open up to enable and enhance the immersive delivery of rich content to mobile platforms. As with anything though, it’s not going to happen overnight. Right now the bugbear with 3D is the lack of supporting cinema screens and similar applies to AR capable devices. However, that will inevitably change. There are 2 types of AR applications at the moment – Mobile & Desktop. Desktop uses marker-based images to create animations (both 2D & ’3D’) and – in some cases – also include interactive controls. I’ll cover this in a future post I think. For this brief post though I’m talking about Mobile AR. This is where an application uses your phone’s GPS to know where you are and its magnetometer – or more simply, the digital compass – to know which way you’re facing. Couple those together then add in the live video feed coming through your phone’s camera and bingo! We have location aware data overlayed on your image of the world around you. Imagine, you’re studying Local History and looking at the changing architecture and layout of the town centre. You stand on a street, point your phone* at a scene and overlayed on the live image are archive photographs of the location spanning the decades. Touch the image of the Town Hall and you’re given the option of viewing a Flickr pool, visiting the town hall’s website, or going to the Wikipedia page and reading up on the history of the building. Buildings, street views, whole town layouts perhaps..
* I must point out that I use the term ‘phone’ very loosely here. What I really mean is the “smartphone”, the pocket sized computer. The gadget in my pocket that is already more powerful than the old PC I have in the back bedroom. Or let’s say you’re on a Geology field trip, trekking around the Isle of Wight. 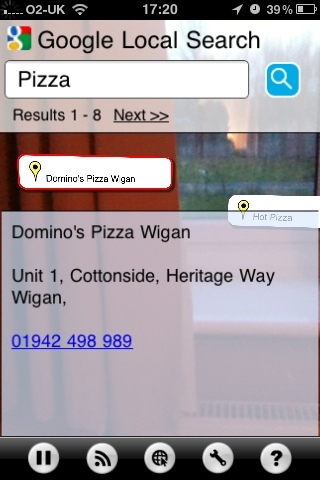 Pointing your mobile device (see, we’re evolving already!) at a nearby outcrop and there on top of the scene, through your camera, are some controls that will display detailed information about what you’re looking at. That it’s made of sandstone perhaps, that it’s river formed as opposed to wind. The difference between river and wind formations! So…AR meets Social Media meets The Cloud you could say. Like I say, there’ll be further posts around this from me – where I’ll attempt to look a bit closer at the applications out there and my thoughts on them.